After years of working in the hospitality industry and with the encouragement of her son, Wendy Puckett took that leap of faith with her passion for food and created Minneapolis' infamous SOULROLL. The origination of these unique gluten-free egg roll wraps stemmed from her two boys despising the taste of vegetables. "I would chop up vegetables real tiny... and they would always eat it without knowing there was broccoli, spinach, cauliflower, onions, or [even] garlic," she said. 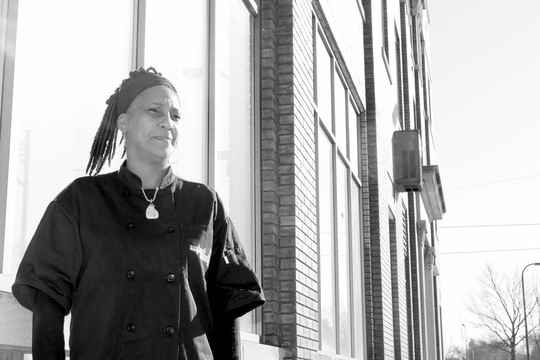 After an injury that impeded her hospitality career, Wendy took on cooking full-time and undertook providing SOULROLLS not only for her boys, but family, friends, and community members as well. "Mom," said her son, "Do it [sell SOULROLLS] for a weekend and see what happens. I'll front you the money [just] see what happens." From that moment, business picked up and looking back was no longer an option. In addition to her two sons, Wendy's grandmother was a central figure behind what she produced and it's meaning. "I stayed in the kitchen attached to her hip," said Wendy. "Anything that my grandmother made was a favorite of mine: the peach cobbler, the salmon croquettes, and the homemade biscuits with peach preserves." Wendy's grandmother was both a "church mom" and dedicated volunteer who naturally came across many people from all walks of life. Her grandmother shower her that food has the potential to erase barriers between individuals and build strong communities. "My grandmother always put food and family together - they were never separated," and so SOULROLL, for that reason, is "purposely written as one and [intends] to stand as one. I don't necessarily think people see color [because now] we're talking about flavor and what makes your taste buds dance...and that's what I love so much about the SOULROLL. "I am at a time in my life where I want to enjoy each and every day and I'm just going to continue to keep stepping out on faith and try new things - you only live once." People hear about it and so it begins - a conversation exchanged from different people, with different life experiences, and talking about a different kind of meal they're about to try together. When you get the chance, try the Nanny SOULROLL (names after Wendy' grandmother, of course) which is filled with fried chicken and mac & cheese, staples her grandmother always had on Sundays in between church hours at the house. "[One day,] I want to see my SOULROLLS in supermarkets, but definitely want to keep it the same flavor [and] continue for it to be my own. I also want a food truck; I have a really neat idea. [Lastly,] I wish some of the moms could get together and make food more flavorful in the school system," Wendy expresses. Community and relationship building are fundamental to her, but she goes on to say, "I grew up in the suburbs so what I see here sometimes is disheartening and I want people to love and appreciate what's around them whether you own it or not. People work hard for their businesses and it would be nice if the community came out and supported them even if it is from the outside - let people know from the outside that we support each other." The Northside Fresh Coalition is a great chance to meet people working towards a thriving, local food system here in North Minneapolis and Wendy's drive for a strong community is a key component for making this work successful. Wendy's final thoughts left us with this: Don't beat yourself up for a decision you make make that may or may not work out in the beginning. Don't give up and let discouragement get the best of you. Truth is, we're not always going to have the right answers the first, second, or even third time around and that's okay - it's normal. Wendy's glowing spirit is undoubtedly noticed when she speaks and her passion for food is undeniably present. When you get the chance, take that step of faith and contact Wendy to order yourself a SOULROLL with her specialty SOUL sauce. I ensure you, as others might too, you'll be back for more. The City of Minneapolis Community Planning and Economic Development Department is currently reaching out to seek interested candidates for a short-term, contract position that would assist with the PEACE Program from mid-March to mid-August (up to 20 weeks). This is s non-benefited position with a pay rate of $25 per hour. A letter of interest and resume from interested candidates should be emailed to shavonda.allen@minneapolismn.gov by February 28. Measures of America has developed report and data tools to help communities better understand the challenges facing opportunity youth and see national, state, and regional trends for this target population's outcomes. In this webinar, Kristen Lewis will (1) provide an overview of the scope of the population, (2) highlight the equity challenges that need to be addressed, and (3) provide evidence of the cost to young people and society of not addressing the challenges of this population. They will be sharing their knowledge with Promise Zones and Performance Partnership Pilot Communities. Measures of America has national and state level data, so Kristen Lewis will use data from the states that are represented among the PZ and P3 communities. Contact Education Coordinator, Hannah Walker, with questions. More than $9 million in frozen Neighborhood Revitalization Program (NRP) funds will be restored to the Minneapolis neighborhoods over the next few years, pending City Council approval. The real estate meltdown of 2008 left the North Side in bad shape. In fact, the City of Minneapolis says, out of the 12 wards four and five were hit the hardest. And nearly six years ago a tornado rolls through and North Minneapolis has a Housing Crisis. Minneapolis city leaders created an official group Friday to advise the City Council and Park Board on matters related to the transgender community. The new Transgender Equity Council is part of an ongoing city effort to identify disparities and work more closely with community members. St. Paul and Minneapolis both passed city ordinances last year that require private employers to provide their workers with paid sick leave to care for themselves or family members. These grants may or may not have PZ preference. You are encouraged to highlight the MPZ partnership in your application.